Opening Friday 30 June at 16:00. Oslo S, exterior facade, sea side of the Flytogterminalen. 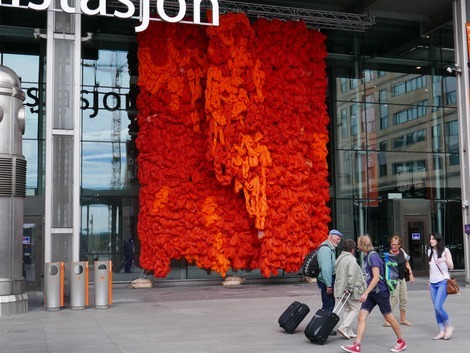 In 2017, Norwegian Textile Artists will celebrate 40 years and artists Sidsel Palmstrøm, Johanne Lund Ness, Malfridur Adalsteinsdottir and Hanne Øverland are marking the anniversary with an art project on the Flytogfasaden (exterior facade of the Airport Express Terminal) at Oslo Central Station. 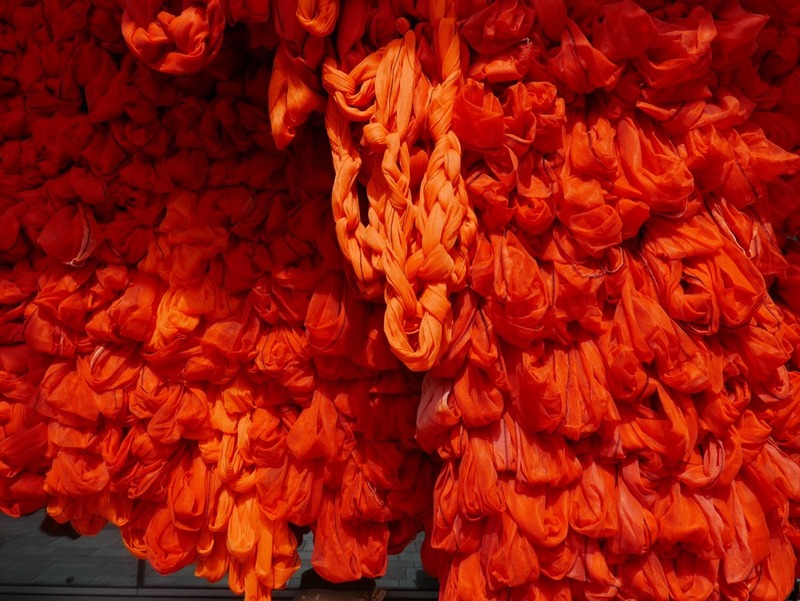 The artwork "Soft Spot" is made of a bright orange fabric, in a material commonly used on facades during construction or renovation. The artists have used textile techniques such as simple draping and crocheting. 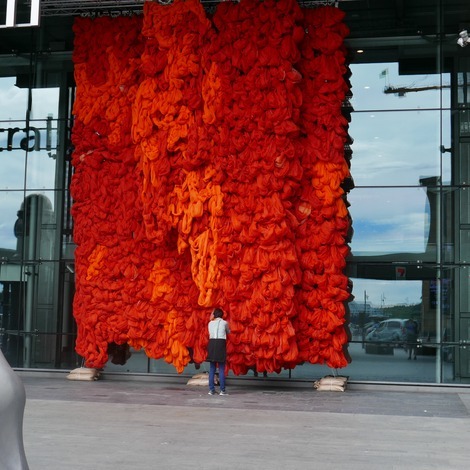 The large-format textile draperies can be perceived as a soft and tactile contrast to the city's hard surfaces. Braiding, weaving and joining of threads or branches is one of the oldest construction methods people have used. Draperies also have clear references to classic visual art with the fabric that protects and conceals, beautifies and covers. "Oslo Central Station can be metaphorically seen as an imaginary fabric with links between people and their chores," says the artists. The huge textile artwork is 10m high and 10m wide and has been produced with the help of skilled assistants from the master's and bachelor's degree programs at the KhiO Textile Department: Alejandra Torres, Lillian Saksi and Julia Wallman. Sidsel Palmstrøm, Johanne Lund Ness, Malfrid Adalsteinsdottir and Hanne Øverland all work within a wide range of expressions and techniques. They work with textiles understood both directly and indirectly, as a material-specific field, and as an underlying driving force and mindset. They have previously collaborated on the exhibition BEHOLDER, at Spriten Kunsthall in Skien.